Yay, I managed to throw something together for Truce Day. Another banner! And like teragramm, I just had to do something with those looks. 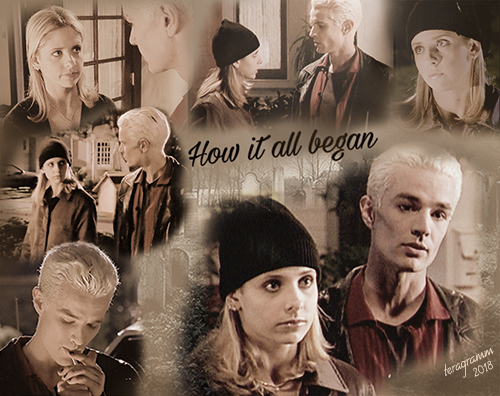 The truce in Becoming is the first time we see Buffy and Spike working together, and what a great team they are. A first step on their way to become… so much more. Hi! I have never posted to this community before, though I’ve enjoyed many of the contributions from others over the years. These days, I mostly sit quietly on the sidelines of the Buffy fandom, but I still love the show and the characters dearly, and seeing that it was the twentieth anniversary of School Hard made me remember a little something I posted a decade ago (hahahaha I am old) to a Livejournal community called adecadeofspike. When I reread it, I didn’t totally hate it, so I thought it might be fun to join in the celebration by reposting it here. Thank you so much to the organizers and contributors of this community for keeping it alive and thriving! Follow this link to read the meta on Dreamwidth. Let’s give molly_may a warm welcome to the comm, and let’s talk about Spike! You can currently comment on the linked DW post without logging in. As these are just glimpses into their heads (and hearts) throughout the series, you really don’t need to read the first chapters posted here in May. Also – again unbetaed due to spontaneity. Thanks so much to the mods for keeping this so very much alive (and dragging me back in)! Follow this link to read the fic on Dreamwidth, and be sure to show the author some love! You can currently comment on the linked DW post without logging in. Voilá! A ficlet set in Chosen that calls back (urgently) to School Hard. It’s Spuffy, but more accurately Spuffy-adjacent. Summary: It’s the end of “Chosen.” Spike is burning up in the Hellmouth, and Buffy’s holding on to his hand, unable to let him go without telling him… except Spike has something to tell her, too. And it concerns her mother. The above link will take you to the author’s site on Dreamwidth. Enjoy.